Preparing for college involves more than covering tuition and books. There are many financial considerations that families need to manage, especially for students moving away from home for the first time. Families that use a 529 college savings plan need to prepare for expenses that are not qualified under the plan. For example, students need to cover daily expenses, meals outside of the college dining hall, taxi service, shopping, and traveling home. A checking account with mobile banking could provide the access they need for these expenses. 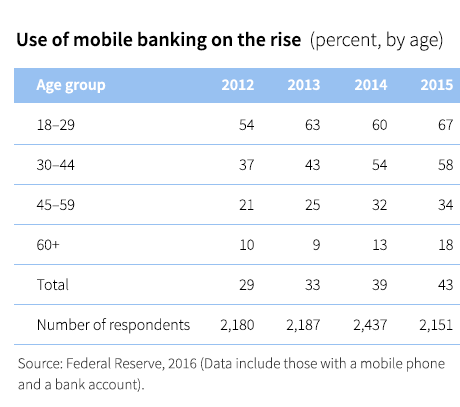 A 2016 Federal Reserve report found 67% of adults ages 18 to 29 who have a mobile phone use mobile banking services. Students who do not already have a checking account may want to set one up before leaving for college. A parent can remain a co-owner of the account until the child reaches age 18 in order to monitor the account and set limits on daily activity. Look for banks that are easily accessible to the school. Find out which banks offer student discounts and benefits. If overdraft protection is not needed, consider skipping it to save on fees. Review the pros and cons of a debit card versus a credit card. Add a savings account to encourage regular saving. Link bank accounts for easy fund transfers. Students may want to apply for a retail credit card to build credit. Students who are under 21 will need someone to co-sign or must have proof of income and ability to pay, according to a 2009 law. Parents and students should coordinate the best way to transfer funds and offer financial support. Transfer funds through linked bank accounts. Explore financial apps that allow money transfer via text message, without the need for cash or cards. Students may not need a car on campus, but if they do, they should research the college rules and financial obligations. Parents need to determine whether a child should be covered by a separate insurance plan. Generally, students can stay on their parents’ policy if they do not own the car, if they still live with their parents, or if their primary residence is their parents’ home. Depending on the location of the school, public transportation may be the best choice. A Zipcar membership may be sufficient if students only need a car part-time. Compare the benefits of a school health plan with private health insurance. Examine the advantages of staying on the parents’ health plan, especially if the student is traveling outside of the country. Consider completing a health-care proxy before a child leaves for school to allow parental access to the student’s medical records. Many students work while going to college. Some colleges offer a work-study program where students can earn money at a pre-screened, partnering company. Students and parents should become familiar with the paperwork needed to apply for these jobs, such as tax forms and payment information. Working can provide students with spending money as well as references and an opportunity to start building a resume. The number of students studying abroad has more than doubled in the past 15 years. According to the Institute of International Education, a record number of students — more than 313,000 — earned credits outside of the United States in 2015. Parents of students planning to study abroad may want to consider creating a financial plan for the trip. Set up an account at a bank with overseas affiliations. Help students understand the exchange rates. Students planning to take a major credit card abroad should inform the credit card company of their travel plans to avoid identity-theft alerts. Many news sources publish helpful checklists for traveling abroad. Depending on the college and the length of the trip, a travel-abroad program may mean that the parent will not have to pay full tuition for the semester, which could represent significant savings. In some cases, a semester on campus is more expensive than a semester abroad. Many students want to travel for fun. Planning several months in advance can help them find the best deal. School-sponsored programs may be less expensive than independent travel. Preparing for college may also be an opportune time to meet with the family’s financial advisor. Creating an expense budget will likely stimulate many questions, such as how does working affect financial aid eligibility, why can’t students use a 529 plan to buy a used car, or when is a computer considered a qualified expense. An advisor can provide answers and help students understand why their parents may need to set new limits on spending.